Editor’s Notes April is.. The month of Easter, were everyone celebrates Easter with family and friends. In addition to Easter’s religious significance, it also has a commercial side, as evidenced by the mounds of jelly beans and marshmallow chicks that appear in stores each spring. As with Christmas, over the centuries various folk customs and pagan traditions, Including Easter eggs, bunnies, baskets and candy, have become a standard part of this holy holiday. 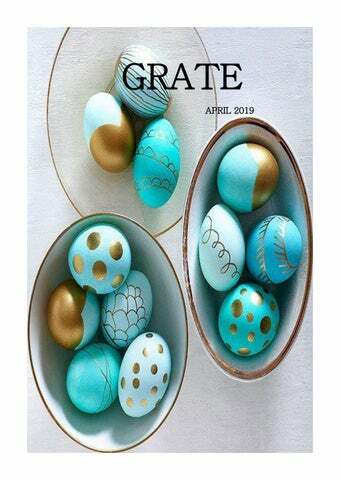 Here at Grate Magazine why we love Easter, is when we can bake Fresh Hot Cross Buns, spread with delicious butter. The delicious Roast Legs, which can be prepared with delicious garden vegetables. The best is always kept for last when you can try and make your own delicious Chocky Wocky Dessert you so desire. As we say at Grate Magazine you can never have enough of a Good Home Cooked Meal which you can’t have enough of. Easter is a Christian Holiday that celebrates the belief in the resurrection of Jesus Christ. The resurrection of Jesus, as described in the New Testament of the Bible, is essentially the foundation upon which the Christian religions are built. Hence, Easter is a very significant date on the Christian calendar. According to the New Testament, Jesus was arrested by the Roman authorities, essentially because he claimed to be the “Son of God,” although historians question this motive, with some saying that the Romans may have viewed him as a threat to the empire. He was sentenced to death by Pontius Pilate, the Roman prefect in the province of Judea from 26 to 36 A.D. Jesus’ death by crucifixion, marked by the Christian holiday Good Friday (the Friday before Easter), and subsequent resurrection three days later is said, by the authors of the gospels, to prove that he was the living son of God. In varying ways, all four of the gospels in the New Testament (Matthew, Mark, Luke, and John) state that those who believe in Jesus’ death and resurrection are given “the gift of eternal life,” meaning that those The Last Supper was essentially a Passover of faith will be welcomed into the “Kingdom feast. However, the New Testament describes it as being given new significance by of Heaven” upon their earthly death. Jesus: He identified the matzah (or bread) he shared with his 12 apostles as his “body” and the cup of wine they drank as his “blood.” These rituals would come to symbolize the sacrifice he was about to make in death, and became the basis for the Christian ritual of Holy Communion, which remains a fundamental part of Christian religious services. As Jesus’ arrest and execution were said to have occurred during the Jewish observance of Passover, the Easter holiday is often close to the former celebration on the JudeoChristian calendar. On April 27, 2017, the United Nations resolved to include World Creativity and Innovation Day, April 21 as a Day of Observance to encourage people to use creativity in problem-solving for all issues related to achieving the 2015 Sustainable Development Goals. 2018 marked the first year the UN observed WCID. Last year I did a series of interviews with people around the world in different jobs and careers to help illustrate that everyone is born creative and to show that it doesn’t matter what industry you are in you can be more creative and use creativity to help and grow your industry. This year I’d like to go bigger and do a multi-day event but focus on promoting Namibian creativity and innovation. The entire event is completely free of charge for anyone to attend and to participate in. The event is Presented by Scribing Dynamics Publishing, hosted by COSDEF Art & Craft and supported by the Namibian Chamber of Commerce and Industry (NCCI). As such the following 1 hour long workshops will be available. Brandt von West will run a series of games with the focus on Creative Problem Solving. Tabea Boye who is a professional speaker on individual growth and owner of the Lighthouse Wellness and Relaxation Center in Windhoek will do a workshop on how to destress and become more mindful. Dr. Rowan van Dyk of DNL Training has agreed to run a few workshops with the focus on Leadership. Morne Venter is a professional graphic designer who will run a workshop on Branding. Motivation Strategies: Elrie Pieterse has agreed to run a series of workshops on Motivation. Internet Marketing: Sondag Haluke is currently publishing a book on Internet marketing and how to buy bitcoins and will do a workshop with that focus. Elrie Pieterse of Toastmasters Swakopmund will have story readings for children. We’ll have free puppet shows and make your own story workshops for children (of all ages). Brandt von West will do a workshop on how to create and present Japanese Kamishibai styled stories is a form of visual and participatory storytelling that combines the use of hand drawn visuals with the engaging narration of a live presenter..
Local businesses will have free stalls to help promote their endeavours. Some of the business that are already onboard are Nautilus Studio, Corporate Event Gear, Bits n Pizzas, Thrones Hospitality Burger Joint, Dance Factory, The Free Show, DNL Training, Namib Prints, Zelda’s Create and many more are to follow. Local sports heroes such as Danny Boy and Delano Muller are also attending and doing a showcase with dancers from Dance Factory doing a stage show as well. As much as this event is to celebrate our individual creativity and innovation, it is always important to understand that we don’t have to go at it alone. There are always so many people willing to help and support and that is vitally important in a busy world that’s getting busier. Come join us at COSDEF Art & Craft Centre in Swakopmund on 15 – 18 April and be part of something amazing. If you want some more insight please follow my Youtube link , to see some videos with the Creative guest I interviewed. Green Cabinets Blue kitchens with brass fixtures were everywhere in 2017, but here’s the evolution. In keeping with a return to nature, green is emerging as the hot hue of choice. To keep it liveable, it’s often given a slight muddy undertone for a heritage flavour. The beauty of this shade is that it enhances the warmth of brass fixtures and makes marble counters look crisp in comparison. Dark Counters Speaking of counters, scratch a little deeper than granite and you’ll find soapstone emerging as a dark horse this year. With its soft, honed finish (which doesn’t require wiping every few seconds to eradicate fingerprints), it’s naturally resistant to bacteria build up and has subtle veining with just enough depth for major drama. Rosemary belongs to the family of Lamiaceae, of the genus, Rosmarinus. Its botanical name is Rosmarinus officinalis. The herb is thought to be originated in the Mediterranean region as a wild, strewing evergreen perennial shrub. Today, it is grown in nearly all parts of the world as a major culinary herb. Varieties: There are basically two types of rosemary, those that are upright shrubs and those that grow as ground covers. In cold climates, rosemary wouldnâ&#x20AC;&#x2122;t survive the freezing temperatures and is more often grown in a pot that is moved inside for the winter. However, some varieties are colder hardy than other types. In warm regions, rosemary thrives outside and may grow into Nutritional value: tall shrubs. For example, upright rosemary plant â&#x20AC;˘Rosemary herb carries great amounts of vitamin A, 2924 varieties run the gamut from 6- to 7-feet tall to IU per 100 g or about 97% of RDA. A few leaves a day in smaller ones reaching around 2-3 feet in height the diet, would contribute enough of this vitamin. Vitamin-A is known to have antioxidant properties and is essential for vision. It is also required for maintaining Storing: healthy mucosa and skin. Consumption of natural foods Rosemary is very hardy and you can preserve the rich in vitamin A is known to help the body protect from flavour all year long lung and oral cavity cancers. Herbal Remedies: Fresh rosemary leaves are a good source of antioxidant vitamin, vitamin-C; containing about 22 mg per 100 g, about 37% of RDA. It is essential for collagen synthesis in the human body. Collagen is the main structural protein in the body required for maintaining the integrity of blood vessels, skin, organs, and bones. Regular consumption of foods rich in vitamin-C helps the body protect from scurvy; develop resistance against infectious agents (boosts immunity) and help scavenge harmful, pro-inflammatory free radicals from the body. Suggested uses: Fresh or dried rosemary leaves are part of the Mediterranean cooking, employed in the preparation of a variety of recipes. The herb is used to flavour in salads, soups, baked vegetables, and meat dishes. Rosemary goes well with tomatoes, aubergine, potato, zucchinis (courgettes). Finely chopped fresh leaves are used in the preparation of delicious sautĂŠed rosemary potatoes. Rosemary tea is a popular flavour drink in Mediterranean region. Freeze it: Plunge fresh leaves in boiling water for no more than two seconds, then shock in ice water immediately. Dry the leaves thoroughly. Place them in a zip-top bag, and freeze. They should hold nicely for up to six months. Drying: The leaves will dry more quickly off the stem but they will remove more easily from an already dried piece of the herb. To remove the leaves, pinch the end of the stem with your thumb and forefinger and pull up the stalk. The leaves will fall off. Remove any of the peripheral twigs and proceed with drying. 30 YEARS OF WINE MAKING AND GLEN CARLOU SHINES BRIGHTER THAN EVER! 2017, a joyous year for Glen Carlou and the beginning of a new chapter three decades of wine making, new owners, new winemaker and Chardonnay still at the top. With the change of ownership finalized in December 2016 and new head wine maker, Johnnie Calitz joining the team, 2017 was off to an exciting start. “For nearly a decade, Glen Carlou has grown to be one of the most successful businesses in the South African wine industry, resulting in a financially sound winery recognized for consistently producing some of the best premium and super premium wines in the Western Cape. The winery is poised to enter a new phase in its illustrious history, and we are excited to take the helm.” New Chairman, Wayne Pitout, expressing his confidence in the future of Glen Carlou. A superb harvest along with the delicate and natural approach in the cellar kicked off a year of celebration. 2017 not only commemorated 30 years of Glen Carlou’s signature Chardonnay, but also cheered a brand new addition to the Glen Carlou Classic Collection – a delicate pink Pinot Noir Rosé. Michael Fridjhon, Wine Wizard, also expressed his excitement over the new vintage under the care of Johnnie: “There’s been an interesting change in the feel of Glen Carlou wines with the arrival of Johnnie Calitz to manage the 2017 vintage. My first impression having tasted the 2017 Curator’s Collection, a small-batch production where the wine maker can make a statement outside the more commercial range – is that there will be a distinct shift in time at Glen Carlou. The 2017 whites are impressive – a function of the vintage itself, which was very good, but also of Calitz’s approach. The Sauvignon Blanc is dense and textured, while the Chenin Blanc intense, very fine and with lovely compote notes. There’s also a clue as to what to expect of the reds in the next few years – at least to judge from the 2016 Classic Merlot, a wine that Calitz would have finished off and bottled. It is soft, plush, juicy and definitely not simple: a real achievement with Cape merlot.” Although the new vintage releases are worth all the rave, Glen Carlou Chardonnay keeps the crown high with the Classic Chardonnay winning a Sommelier Selection Gold and named South African Young Wine of the Year’s Best Chardonnay, while the Quartz Stone Chardonnay won Michelangelo Wine & Spirits Gold, a 92 point Tim Atkin Master of Wine grade and maintained a 4.5* John Platter rating. Beyond the exceptional year in wine, Glen Carlou saw the opening of its second extraordinary all South African art exhibition in The Gallery @ Glen Carlou showcasing unique installations of contemporary, pop and modern art by local artists, curated by Alex Hamilton. The Tasting Room @ Glen Carlou welcomed the Franschhoek Wine Tram and The Restaurant @ Glen Carlou showcased four unique menus inspired by the seasons and launched a seasonal breakfast menu, cementing Glen Carlou’s position as one of the Top 30 Restaurants in the Wine lands. As 2017 comes to an end and the 2018 harvest drawing near, we look forward to a promising 2018 celebrating Glen Carlou as a Wine, Food and Art Destination for the next 30 years to come. CHARDONNAY 2016 Chardonnay is one of the most famous and widely planted white wine grapes around the world. Its spiritual home is Burgundy, France. Chardonnay is the most malleable of wines with an affinity for oak which will impact flavours and characteristics. The fruit for this wine is sourced from ten different vineyard sites. All fruit for this wine is hand harvested over a three week period resulting in a number of batches with varying sugar and acidity levels. The result is a well balanced wine with elegance and restraint. Glen Carlou uses special water-bent barrels from a cooper in France. These sophisticated barrels impart a light touching of oak and allow the fruit to express itself, producing Glen Carlou’s Classic Chardonnay style. GRAND CLASSIQUE 2013 The name Bordeaux derives from the French au bord de l'eau which means "along the waters”. Bordeaux red wine is typically Cabernet Sauvignon, Merlot, Cabernet Franc, Petit Verdot and Malbec. Carmenère are also allowed. The phrase, which seems to have originated with British wine merchants in the 19th Century, relates as much to wines made from the blend as to the grape-variety combination itself. Far from being an officially defined or legal term. Our Grand Classique is a blend of the five noble grapes: Cabernet Sauvignon, Malbec, Merlot, Petit Verdot and Cabernet Franc. Giving you a good depth of colour, soft, round and showing some nice body. These wines often have great fruit concentration, softer tannins and are longlived. The Grand Classique varieties are from selected vineyard sites - handpicked, crushed, macerated, fermented and aged in French Oak Barrels separately. This way each variety enhances its character to bring this blend to its best. MERLOT 2016 The name comes from the Occitan word “Merlot”, which means “young blackbird” (“merle” is the French word for several kinds of thrushes, including blackbirds); the name was thought to have been given either because of the grape’s beautiful dark-blue colour, or the blackbirds’ fondness for grapes. The softness and fleshiness of Merlot makes it a popular grape for blending. The vines planted in Alluvail soils with good drainage, results in small concentrated berries, which delivers a well balanced wine that offers Intense fruit flavours. Gut-Friendly Food Fermenting, pickling and preserving reaching the mainstream. Gut health is set to be a big food trend for 2018. This includes probiotics like, kimchi, miso and kefir. Prebiotics such as onions, garlic and other alliums. Boozeâ&#x20AC;&#x201C; Free Beverages Non Alcholic drinks are a growth in the Food and Drink industry, our forecasters say that Health-conscious millennials are drinking booze less and less. Premium tonic waters with interesting flavours,nonalcoholic 'spirits' and botanical mixes are flooding in to fill a gap in the market. Hawaiian Food Poke bowls are everyday food in Hawaii essentially sushi without the fussy presentation. Food Trends Timut pepper Timut pepper from Nepal, is spiky, zesty surprisingly grapefruity and leaves a tingly residual heat on the palate. It's also been tipped Asda as being the next big condiment for 2018. Hyper-Local Food Although some chefs have long supported the hyperlocal movement, it’s only grown more popular in recent years. Now, there’s more of an expectation among customers and industry professionals for some level of hyperlocal menu sourcing at many restaurants. Chefs in training should also recognize the power of hyperlocal sourcing to enhance their cooking and incorporate locally sustainable flavours into a variety of dishes. â&#x20AC;Ś...because it's a lot easier to lick frosting off this wiper than off the tines of your whisk. Melon lovers now have it easy with this tool that separates the fruit from its skin, sans knife. It's a perfect tool for kids and adults alike to make quick (and healthy) work of snack-time, and you can even use it to separate the seeds from the fruit as well. Food is Free Swakopmund started in 2015 during a dinner discussion between Brandt Von West and Divan Mouton. After swapping some typical teacher stories Mr Mouton said that he finds it sometimes extremely difficult to teach children who have to come to school everyday on empty stomachs and teach students that don’t care about standing up and doing the right thing. We knew that growing food wasn’t going to be enough and that leadership and responsibility was needed to keep the garden growing. As such I took the mentorship program and leadership development ideals that is integral to the Toastmasters program and adapted it to suit the students. We put systems in place where the older children would help and develop the younger children and continuously share experience and knowledge with each other. The conversation followed into the late night and we started asking better questions. What could we as individuals do to help just a little and try to solve this problem. At the end of 2017 we handed over the entire project to the school in focused on expanding the idea of Food Is Free. Currently the idea has spread to a variety of schools and communities across Namibia, Botswana and South Africa. Being part of Toastmasters my mentor suggested I look into something called FOOD IS FREE the concept of which is to essentially grow food and share what you don’t need. I took this idea and decided to create a FOOD IS FREE PROJECT inside the school. We learned that not everything has to be in place before you start but you do need to start. We had an idea that we developed and reached out to numerous people for help, celebrities for promotion, organisations for sponsorship and we got things done. Mr Mouton spoke to Mr Martin who was the principal of the school and we made an agreement. Then the real work started. We found that we were quite over our heads regarding growing food, irrigation, pest control and the like. But we learned and grew relying on sponsorships from Dunlop Zone for old tyres to grow tomatoes in, Omega Security in Walvis Bay sponsored tools and Namport sponsored netting to help keep away pests. Prunes and plums contain high levels of phytonutrients called phenols. Theyâ&#x20AC;&#x2122;re particularly high in two unique phytonutrients called neochlorogenic and chlorogenic acid. Numerous studies show that these phytonutrients help to prevent damage to cells particularly when it comes to the oxidation of lipid molecules in the body. Since all of our cell membranes, as well as our brain cells, are largely made up of lipids which contain fat, these are important phytonutrients to have in the diet. These compounds have also been found to inhibit the oxidation of LDL cholesterol in the body, making them an important factor in the prevention of chronic diseases. Namibia’s Flavour’s Namibia is bordered by Angola, Zambia ,Botswana and South Africa. The coast with its productive fishing grounds and deep water harbour of Walvis Bay, is edged by dunes and gravel plains of the Namib desert. Namibia has a varied range of local dishes with its unique flavours. Namibia is also known for their meat which is highly desired and eaten as often as it is feasible daily for some and for others in special occasioning. Namibia has a wide variety of game as compared to other countries. In Namibia Kudu, Springbok, Eeland, Hartebeest, Oryx, Ostrich and even Crocodile came up on menus . Game in Namibia is very popular during winter period or all year round. Namibia is known for making the best biltong. Biltong is made from first marinated for days then spiced and then hung to dry for 2-3 weeks. This meat can stem from game or beef. Namibia is also known for having the best beef in the world as our cattle are not left in one place but are left to roam freely. Omajova which is called a wild delicacy. Omajova comes from the towering termite mounds reaching heavenwards from the savannah characterise many areas of Namibia. Omajova is the wild mushroom that are harvested by the locals, supplementing diets and income. Although they have their own unique flavour they are best cooked in butter and salt. Whether eaten a la crème, fried with asparagus and cherry tomatoes in an omelette, crumbed or wrapped in silvers of Salmon the mushrooms provide a tasty treat. Another seasonal ingredient is the Nara plant in Namibia. The Nara melon grows in the coastal region of the Namib Desert in Namibia. The seeds are highly nutritious containing 57% oil and 31% protein. The seeds are eaten like nuts and taste similar to Almonds. The sweet flesh fruit can be eaten raw but can burn the mouth. The Nara is also made into Nara Oil which is a very delicate oil and has a very strong taste delicious with salads. Namibian Oysters is a delicious delicacy. They are becoming one of the largest oyster suppliers in the world. Much like a fine wine oysters vary greatly depending on the environment in which they are harvested. The top layers and aftertaste all may vary to produce hundreds of distinctive characteristics and flavours. When you open up that shell, it’s a full oyster. Then the taste of the ocean, It’s fresh , sweet and salty. Unlike the European truffles, the more affordable desert truffles favour arid and semi-arid areas of the world and are found in the Arabian Peninsula, the Mediterranean basin, North Africa, Australia and the Kalahari Desert – Namibia, Botswana, South Africa and Angola. Truffles are hypogeous fungi, fungi that have their fruitbodies growing below the ground. The Kalahari truffle, or Kalaharituber pfeilii (once known as Terfezia pfeilii), is smooth like a potato and has a nutty mushroom taste. The edible fungi form a symbiotic relationship with the roots of several plant species, most commonly, the Tsamma melon. The ripe fruit dries and shrivels as it is exposed to the sun, releasing invisible spores. These are distributed by the wind, remaining dormant in years of drought. Kalahari truffles can be eaten raw or cooked in a variety of ways: boiled, buried in hot ash or searing sand, roasted over the fire or fried with onions and seasoned with salt and pepper. They are commonly known by their Nama name !nabas. Although less flavoursome than its distant European relative, the Kalahari truffle is a treasured desert fungus, and one of Namibia’s wild and delicious 'veldkos' delicatessen . SWEET POTATO SOUL: 100 EASY VEGAN RECIPES FOR THE SOUTHERN FLAVORS OF SMOKE, SUGAR, SPICE, AND SOUL BY JENNÉ CLAIBORNE Vegan cookbooks are so hot right now, and out of all of the amazing vegan cookbooks coming out this spring (notably: Hot for Food Vegan Comfort Classics and Vegan 100: Over 100 Incredible Recipes from Avant-Garde Vegan) I’m most interested in Sweet Potato Soul from NYC-based blogger, personal chef, and cooking instructor Jenné Claiborne. Claiborne’s food looks amazing— comforting and substantial with beautiful colours, textures, and flavours. America knows and loves Giada De Laurentiis for her lighter, healthier takes on classic Italian fare. In her newest cookbook, she invites fans and home cooks to get to know the flavours and stories that have inspired her life's work. Here, she shares recipes for authentic Italian dishes as her family has prepared them for years while infusing them with her signature fresh flavours to make them her own, like in her Grilled Swordfish with Candied Lemon Salad; Spaghetti with Chianti and Fava Beans; Asparagus with Grilled Melon Salad; Bruschetta with Burrata and Kale Salsa Verde; and Fennel Upside Down Cake. Filled with gorgeous photography of Italy, peppered with family stories, and complete with more of Giada's tips and advice for cooking up fabulous meals with ease, Giada's Italy is a stunning celebration of Italy's flavors as only Giada could present them. Tasting Paris features new and classic French recipes and cooking techniques that will demistify the art of French cooking and transport your dinner guests to Paris. Whether you have experienced the charm of Paris many times or dream of planning your first trip, here you will find the food that makes this city so beloved. Featuring classic recipes like Roast Chicken with Herbed Butter and Croutons, and Profiteroles, as well as newer dishes that reflect the way Parisians eat today, such as Ratatouille Pita Sandwich with Chopped Eggs and Tahini Sauce and Spiralized Zucchini Salad with Peach and Green Almonds. With 100 recipes, 125 evocative photographs, and native Parisian Clotilde Dusoulier’s expertise, Tasting Paristransports you to picnicking along the Seine, shopping the robust open-air markets, and finding the best street food—bringing the flavours and allure of this favourite culinary destination to your very own kitchen. Mauritius, is an island nation in the Indian Ocean about 2,000 kilometres off the southeast coast of the African continent. The country includes the islands of Mauritius and Rodrigues, 560 kilometres (350 mi) east of Mauritius, and the outer islands (Agaléga, St. Brandonand two disputed territories). The islands of Mauritius and Rodrigues form part of the Mascarene Islands, along with nearby Réunion, a French overseas department. The area of the country is 2,040 km. The capital and largest city is Port Louis. It is a member of the Commonwealth of Nations and the African Union. The island of Mauritius is relatively young geologically, having been created by volcanic activity some 8 million years ago. Together with Saint Brandon, Réunion, and Rodrigues, the island is part of the Mascarene Islands. These islands have emerged as a result of gigantic underwater volcanic eruptions that happened thousands of kilometres to the east of the continental block made up of Africa and Madagascar. They are no longer volcanically active and the hotspot now rests under Réunion Island. Mauritius is encircled by a broken ring of mountain ranges, varying in height from 300–800 m (1,000–2,600 ft) above sea level. The land rises from coastal plains to a central plateau where it reaches a height of 670 m (2,200 ft); the highest peak is in the southwest, Piton de la Petite Rivière Noire at 828 metres (2,717 ft). Streams and rivers speckle the island, many formed in the cracks created by lava flows. Mauritius is ideally positioned for game-fishing. Depending on the time of year it is possible to catch blue or black marlin , sailfish , wahoo , yellow fin tuna , giant trevally , dog tooth tuna , bonito , dolphin fish, sharks and many more. The majority of the big game fishing boats are well equipped with VHF radio, mobile telephone, GPS navigation system, radar, radio telephone, safety equipment, Penn International reels, life jackets, medical kits, fire extinguishers, flares, and all related fishing equipment such as fighting chairs and rods (usually 9). You can choose between half day and full day fishing trips . Big game fishing is best on the west coast of Mauritius because the currents swirl around the foot of Le Morne, creating a marine environment attractive to bait fish, which in turn attracts the larger fish. Boats usually accommodate up to 5 anglers and full day trips typically include both breakfast and lunch in the price. The Safari Jeep trip takes place in Yemen natural reserve park on the West Coast of Mauritius. It hosts two of the longest rivers on the island – Rivière Rempart and Tamarin River – and is a haven for all sorts of native and exotic wildlife. The actual size of this natural reserve is of around 4,500 hectares. The Yemen Park is the setting for Safari trips where you will have a thrilling ride and will be able to see many beautiful animals such as Zebras, ostriches, African antelopes, Java deer, monkeys, ducks and geese, and will see extraordinary panoramic views of this breathtaking part of the island. Diving in Mauritius is spectacular, with the extremely white sand, ultra blue water, emerging delecated coloured soft coral re-growth massive shoals and dramatic topography with varied and abundant marine life. Most of the dive sites are located in the North, with dive boats launching from Pereybere, Cap Malhereux, Grand Gaube and Trou aux Biches. There are also dive sites at Flic en Flac in the West, in Bel Mare in the East and Blue Bay in the South. The Northern Islands are accessible from Pereybere, with close 10 minute boat access to Coin de Mire, a protected Island where the Djabeda, a spectacular wreck lies. The wall of the Island, the caverns and caves and swim -though passages are exciting dive sites for advanced divers. Confetti Bay is shallow, exquisite and perfect for family groups. Also worth diving is the Cathedral which is located off Flic en Flac on the western coast of Mauritius. Mauritius offers Wreck diving, massive shoals, exquisite corals, large schools of pelagic fish and shark diving. Recently with the re-growth of the coral reefs through a govenrment conservation initiative the numbers of the endangered Green Turtle, (Chelonia Mydas) has increased dramaically. Marine life is colourful and varied. Around the Island are ship wrecks dating back to the 18th and 19th centuries, or some ships sunk more recently which create beautiful artificial reefs. Other dive sites in Mauritius include Whale Rock and Roche Zozo where a pinnacle emerges from 60 metres from the ocean floor, and the submerged crater near Ile Ronde, where a variety of sharks come to sleep during the day. Mauritius is almost completely encircled by a barrier coral reef which is home to many sponges, sea anemones and a variety of shoaling fish and some rare species endemic to Mauritius alone. The Blue lipped Angel, the Mauritian Gregory and the rare orange Mauritian weedy scorpionfish are among these. Macro life is also varied. Diving is good all year round, with very good visibility and a water temperature between 24 and 29 degrees. The Mauritius Scuba Diving Association (MSDA) can provide further information. Go on a speed boat trip and watch dolphins in the open sea. You can choose between 2 hr trip, half day and full day trips where you will get to watch with the bottlenose dolphin and the spinner dolphin, which have made of the West Coast of Mauritius a place for them to rest before going to the deep sea for their fishing. Take a Trip to your beautiful Destination …. I eat too many eggs for them to ever go bad, but this sure is good to know. I got so excited when I saw this, I dug into my fridge to test it for myself. My eggs seemed to be 4-6 days old , good enough! You’re probably wondering how this works, and yes, there is some science behind it. Eggshells are porous, allowing air to slowly get in over time. As more air enters the egg, it gets lighter and lighter, which explains why it will eventually float. DIY EASTER BUNNY NAPKINS My favourite thing about easter are all the bunnies. …wait that’s not true. It’s the chocolate. Definitely the chocolate, and then the bunnies. So to spruce up your easter dinner table this year, we have DIY Easter Bunny Napkins with Free Printable. Yep, a free printable to add lots of cute bunnies to your decor – because if you’re ever gonna OD on bunny decor, Easter is the time. STEPS - Download the free printable and print onto iron sheets designed for light fabrics. Cut the bunnies into long strips. - Iron any wrinkles out of your napkins, then place your strips face down side by side along the length of your napkin. Iron on according to instructions of your iron on paper. - Hand stitch the pom trim on the underside of the napkin, along the same edge as the bunnies. Make sure when stitching that your needle does not poke all the way through the napkin. You want to stitches to be on the inside of the existing border seam to hide the thread. I think the hardest part was lining up the bunnies and ironing them on straight. If you look closely, the bunnies on the green trim napkin are ironed onto the border seam â&#x20AC;&#x201C; oops! Just be patient before setting that iron down, cause once you do thereâ&#x20AC;&#x2122;s no going back. Philip Klynsmith We Introduce you to the new President of The Namibian Chefs Association. Grate Magazine wanted to know a bit more about the new man on the block. Trend Forecast Easy to answer: Fast, healthy, over the counter. If only we can lose all the preservatives in pre-packaged food . 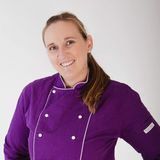 If I have to name 1 person, Sanet Prinsloo, who has built and brought the Chefs Association to where we are now, who inspires people to cook and bake, and mentors so many young cooks and chefs. But my inspiration come from every person I meet at a competition or in a kitchen, in a restaurant or coffee shop, and even the waiters who serves his/her customers with energy and passion. You see it in these people’s eyes when they make eye contact: they enjoy what they do, they want to make your food experience exceptional. That chef, cook, waiter, manager, barman, they inspire me to show more people this fantastic industry. Internationally I immediately think of all the usual suspects, but there are 1 lesser known chef that moves me. Chef Tom Kerridge. The first ever chef to get a Michelin star for pub food, he now has 2 Michelin Stars. He uses my favourite meat in his signature dish; Pork belly that is wrapped in pork skin, roasted and served with a stuffed pork trotter. He was a massive man, and with hard work he lost ¾ of himself, and made that into a BBC food programme. He has featured on a couple of BBC programmes, and keeps expanding his Michelin quality pub food empire. The day he opens his first pub in Africa, hopefully Namibia, I will be there. Destination to Travel Anywhere, as long as I get the chance to taste the local delicacies. I do not necessarily want to eat at the top restaurants, I want to eat from the “ouma” who makes food at a little back street. They are the ones who taught the local top chefs to cook. What is your favourite holiday dish In the Winter, Mac and Cheese, the way my wife makes it. But as it is summer now, and we do not have a white Christmas in Namibia, Pancakes (crepes), with various fillings, can be done warm on the rainy days or cold for lunch, can be sweet or savoury, and I even do a breakfast or brunch pancake. Something Dry, really DRY. A Pongracz Brut, real fruity flavours, soft bubble, closest to the expensive French Champagnes, but as good or better than some overseas brands . Childhood Memories Me and my family were talking about this a few weeks ago. I remember the kitchen being cleared, the whole floor covered with newspapers, and my mother and me and my younger sister, mixing , kneading, and rolling out ginger cookies, or other small cookies, on the floor. We, could not reach the table tops yet. Then of course we had our big Sunday lunch, a Roast, Chicken, Fried Potatoes, Rice, not a lot of vegetables, but we had sweet carrots, green beans with bacon, Cauliflower with a thick cheese sauce, and dessert had to be a baked pudding with custard, jelly, and ice-cream. Those were the days we could still go overboard.